The reason most entrepreneurs or small businesses (who do not have a full-time office) will rent a day office is to impress a client or prospective customer. The trick is to find a cheap day office or cheap meeting room without looking cheap. You also do not want to find the most lavish looking day office that might scare a prospect off by thinking your product or service will be too expensive because of the perceived high-end office. The key to renting a day office is location, as it would be with renting a full-time office. This is especially true if your clients and customers you plan on meeting with (on the same day) are in a specific geographic area. But most often, a central downtown location is the most desired place to have your day office. Besides entrepreneurs looking to impress customers with the atmosphere and amenities of a professional office, day offices are also used by business people and who do not need a full-time office. These are usually outside salespeople or mobile businesses that occasionally need a place to get some paperwork done – or a quiet place to work that is not their home or an actual job site. When assessing the cost of a day office rental, you may want to consider the number of times per month that you need one. If you need a day office more than twice a month, you may want to consider a shared office space at a business centre that also affords you access to boardrooms in order to meet clients. Shared office situations often come at the same price or less than two daily office rentals. Sometimes when you think you need to rent a cheap day office, you may find that renting an inexpensive yet upscale meeting room might be better. 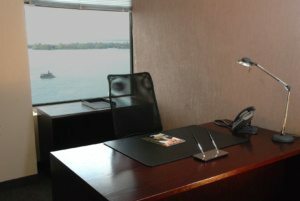 Office business centres that rent day offices may also rent your a boardroom or meeting room for about the same price. Working From Home Sounds Great in Theory, but is it Easy?